Failing to live up to your high potential? Apply seven simple strategies to exceed your wildest ambitions. Are you leaving time and money on the table? Has your quest for personal development failed to develop? 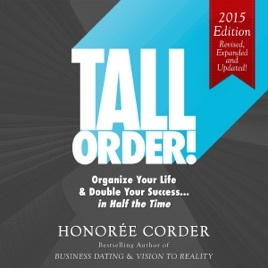 Let personal transformation expert, Honoree Corder, put you on the right path to success. Tall Order! is the no-nonsense, fluff-free, down-to-earth guide you've been looking for to define your life's main goal - and get it! Whether you're a business owner, an aspiring entrepreneur, or a student of success, Honoree's book will guide you to your highest potential and the best version of yourself. If you like simple, witty motivational books that give you a kick in the pants to take action, then you'll love this mega dose of inspiration.